Is he tall or microscopic? Where does he live? Why is he so sad? Rock Paper Scissors- Tell 2 kids who voted for different options to stand and play Rock Paper Scissors, of course narrating in your target language…If Sam wins, our guy is a basketball player but if Ryan wins he is an astronaut…Kids love this one because someone wins. And everyone loves winning! Just to make it another opportunity for CI, here’s a slide I project to explain the game in Spanish. If you’d like to translate it into another language, I’d love to share it here! Whiteboard spinner- I got these nifty magnetic Whiteboard Spinners that are fun to use. Follow the whole voting procedure, but write out the options on the board, plant the spinner in the middle and call up a lucky kiddo to spin the spinner. It is also fun (maybe more for me than them!) ask the class if we should do a listening/reading/vocab quiz and let the spinner decide Bahaha We’re reading Bart quiere un gato in Spanish 1…it’s a fun choose your own adventure style novel that I highly recommend! Giant Dice- I suppose you could use normal sized dice but Jumbo Foam Dice are more fun! 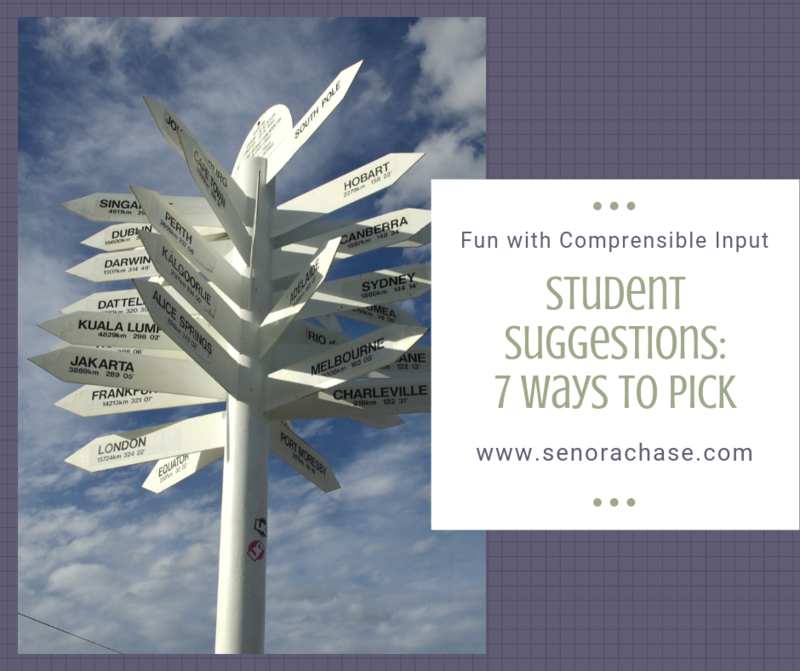 Like with the spinner, solicit suggestions and write the 6 you like best on the board with a corresponding number. Ask a volunteer to roll the dice to decide the character’s fate. This one is fun for more elaborate back stories or motivations. You could really discuss and write out a short paragraph for each number. This one is also fun because we live in Nevada and it feels like you’re at a high stakes craps table in Vegas rolling for Big Money. It might not feel as thrilling in your school… Again Bart quiere un gato…choosing the next chapter with a giant dice. Magic 8 Ball- Magic 8 balls are always fun! I found an awesome one from Teacher’s Discovery years ago that answered in Spanish! But unfortunately it looks like they don’t make it anymore. Here’s the old classic Magic 8 Ball from Amazon, or here’s a post about an online Spanish version. Magic Cards- Sometimes I’ll ask a question, listen to student suggestions then randomly select a student with the awesome magic cards to tell us the answer. Ask them a question in Spanish, and if their answer demonstrated they understood, give them a listening grade right on their card. And if they answered back in Spanish, go ahead and give them a speaking grade as well. Triple whammy! Secret number- Teacher (or a student) writes the secret number on the board, and then covers it up. Teacher asks for suggestions and then the student guesses the number…the kiddo whose number is closest to the secret number is the winner and their suggestion is incorporated into the story. Great ideas!! With CI in each and every one! !